Good morning everyone. As you have all been able to tell from recent weeks, the current server we have up is not populated due to lack of interest. We have been heavily discussing our plans for the future and after some deliberation have decided to remake the server from scratch fulfilling all the requests for playstyle that have been requested. Namely, we will be making a new server that adds all of the armed vehicles into the game. Everything that does not have treads, from jets to the 6 wheeled vehicles will be available to buy and use. Secondly, we will be adding all the restricted items from the previous server. There will no longer be a item distinction between civ and rebel, and will have a much different scenario setting that the civilian one we have done previously. This server will be kavala based like olden times and the majority of non-lethal activity will take place there. The new scenario is that instead of a civilian police force trying to fight armed rebels, The whitelisted faction on the island is the native peacekeeping army that is run by the government of the island and are more heavily geared in similar fashon to NATO peacekeeping soldiers. These peacekeeping soldiers, the Altis National Guard, have a military rank structure along with an air force and a special forces division. On the ground they will work on keeping the peace in the one city they have full control of (Kavala), and outside of that city will fight the rebels hard for control of the island. 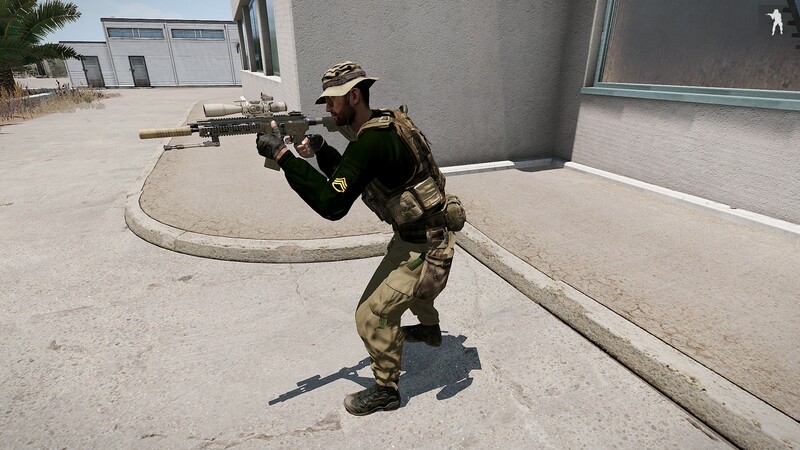 New military style uniform skins are being worked on for the whitelisted faction. There will be no restrictions regarding initiation with armed vehicles and no distance limit. However, there will be a small city limits circle around kavala and within this circle no armed vehicles from any faction will be permitted. The majority of legal farming runs on the island will be removed and more illegal activities will be added. We plan to have AI convoys, patrols, and encampments taking turns running at all times as the main source and way to earn money outside of illegal farming or robbing stores. Many of these AI missions will include armed vehicles. New rebel bases will be moved and built along with entirely new physical map assets more designed for combat that are closer to kavala and continue with our principle of not needing to fly just to get anywhere. New gang hideouts will also be built and there will be a pack of dogs to chase boop around. The last server we made, we rushed in about three and a half weeks. This time we would like to get everything done before we release to the public and plan for a release just before spring break. We have a test server up that staff / bug testers will be on troubleshooting during this intermediary period and we will post our progress and continue to ask for community feedback. In fact, your feedback, questions, opinions, and criticism is welcome on this thread and the discord, as well as in PM's to us. DuckHunter is no longer the Chief of Police. What was the chief is now the General of the Army and the assistant is the Colonel. Dusty is the new General of the Army, and Sharkbait is the Colonel. A new roster has been created and new protocols are being churned out by Captains Burrito, Jordan Jay, Nate Gomez, and Lieutenant Cousins. There are several new additional Ranks within this army and they are working on some finer details. No currently whitelisted officers will lose their whitelist going into this new server. Badger is looking into possibly changing the name of the EMS to the Red Cross or Coast Guard due to the scenario and will likely get some feedback from interested parties there. We really hope to make something here that is different and unique that you guys will enjoy and we can all have some fun on. The Altis National Guard will have tan marked patrol vehicles along with a green and tan soldier uniform. The following is an early iteration. This sounds badass is it gonna be a whole new server, in other words is the current one shutting down and getting replaced by this? Do you want any help testing or anything? I hope i can help John wick on the new server with my credit card number, the magic numbers on the back, as well as the expiration month and date? Make sure there's body looting. Will there be tasers in the new server? body looting? Or like before the argument is that it encourages RDM? sorry I mean't what about body looting; will that be in the server? Will there possibly be a return of the press group? Would be neat if it was thought of more as a War Photographer type role, or when news outlets occasionally venture into activate fire zones to get footage, etc.